Steal a painting for Queen Akorithi. Receive a letter from Queen Akorithi asking for assistance. Talk to her in Castle Sentinel, where you are instructed to steal a painting from the treasury of Wayrest. 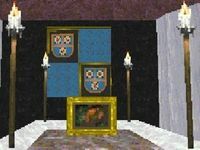 Enter the dungeons of Castle Wayrest and find the painting. Return the painting to the queen for your reward. A page girl bearing the crest of Sentinel stiffly presents you a crisply pressed envelope. Ignoring your queries, she turns and walks away. before the end of the next season. high praise. I await your arrival. "(Player's name)! Welcome to Sentinel. I trust you have had a comfortable stay so far. Let me get right to the point. My son, Prince Lhotun, says you are a well respected and trusted (player's race). I have need of your sort. I am willing to pay you (random gold) gold to infiltrate Castle Wayrest and recover an heirloom of the late King Lysandus for me. Will you do it?" "What Bounty! There is an item, a painting, that is hidden somewhere within Castle Wayrest. I desire this item for reasons you need not worry about. Bring it to me and I will pay your (random gold) gold." Take your leave, and travel to the City of Wayrest. Find and enter Castle Wayrest to begin your search. In the castle dungeons you will encounter mostly knights, orc shamans, centaurs, wraiths, and vampires. Starting from the dining hall, take the door to the north. As soon as you open the door, the royal knights will start to attack you. One of them is right in front of you in the hallway. From the intersection, go west and up the stairs. 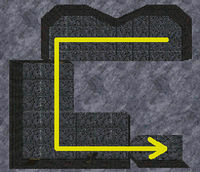 Follow the hallway until you reach a room with several open coffins. In this room there are many open coffins and corpses. On the south wall there is a red brick teleporter. Head on through it. You will be teleported into some sort of armory with another teleporter. 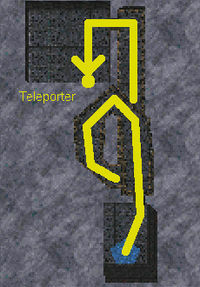 Go through this teleporter as well. 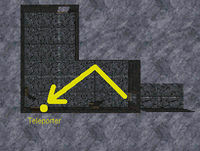 You will be teleported to the northwest corner of a tiny room with yet another teleporter. Take it to go to the next area. You will find yourself in a room with a torture instrument. Leave the room through the south door and follow the hallway to the west. After passing through the door, go south. Follow the hallway west, past an intersection and go down the stairs. Follow the hallway further past a secret door and go up the stairs. Go through the door at the end of the hallway to reach the sewers. Walk along the sewers, making sure not to fall in if you aren't prepared for swimming. The water usually contains slaughterfish & dreughs, but it can also contain undead and, at higher levels, lamiae. Jump into the water at the west side of the room and look at the wall. 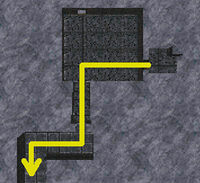 There is a small underwater passage which leads to an inner chamber with more aquatic enemies. Crouch and swim through the passage, then climb out of the water and go through the locked door at the east side of the chamber. 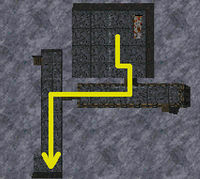 Follow the stairs up and go east to find a small opening in the wall. 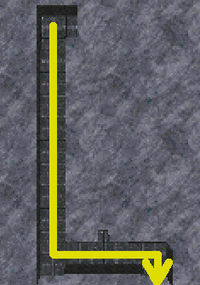 Walk towards it and climb the bottom part of the wall until you stop, then jump to vault through the opening. Go up the stairs and head west through the door at the end of the hallway. You will find yourself in some sort of meeting-room. 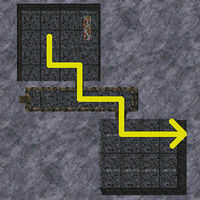 Go through the locked door to the south, then go up the stairs and continue south. Follow the hallway further south and turn east at the intersection. Go past a door and turn south. Head further south and go down the stairs. Follow the hallway and go through the door. Go down the stairs, follow the hallway and go through the door at the end to reach the room where the painting is located. When you approach the painting, one knight will come out from each of the doors, so be ready for them. Take the painting after dispatching the knights. As you examine the painting a little more closely, you notice it definitely isn't a normal painting. The scene in the painting shifts and twists. You can clearly see the inside of a tent. Several men in the livery of Wayrest are intensely debating with a man bearing the coat of arms of Daggerfall. One of the Wayrest men slips behind the Daggerfall man, draws a dagger and casually slides it between his ribs. The image fades as the life ebbs from his body. If you have no Recall spell, you must return to the teleporter room with the torture instrument to get back. From this room, walk a few steps to the east and enter the room. Go through the secret door on the east wall. Follow the orange passage up the stairs, jumping or climbing if necessary. 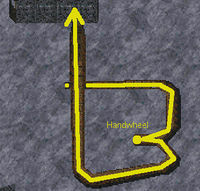 Follow the passage up until you come to a small intersection and a handwheel. Turn the handwheel to open the magically-locked door at the end of the passage, then continue through. Leave the room through the west door, cross the hallway, and enter the room on the other side. Go through the red brick teleporter in this room. You will emerge in a fountain. Walk down the stairs and go north at the intersection. 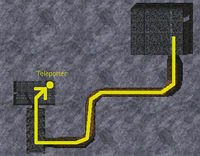 Continue until you reach a room at the end, and go through the teleporter on the south wall. Leave this room through the secret door on the south wall and go through the orange colored passage. Once you reach the hallway, go north and enter the room. Leave the room through the red brick teleporter. 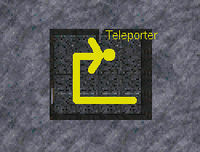 You will be teleported to the room where you started your teleporter journey. Leave this room through the east door. Return to the dining room and exit the castle quickly, as the guards will all be hostile towards you now. "Excellent. Its properties are inappropriate for those not of royal blood. You have shown yourself to be not only loyal, but also obedient." "You presume much (player's name). What you saw is not for the prying eyes of the masses. It concerns matters of royalty and will be dealt with by royalty." If you say you didn't use the painting, you will gain reputation according to the table below. If you say you did use the painting, you will gain reputation according to the table below. 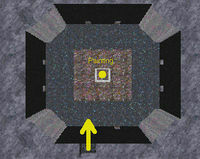 The Daggerfall Chronicles refers to this quest as "Painting the Truth". 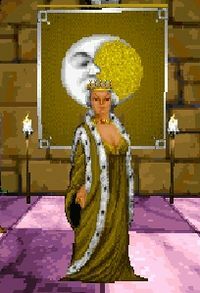 0 (Date): Queen Akorithi has set me to infiltrate Castle Wayrest. Somewhere in its dungeons is a painting that she desires. If I can place it in her hands, she will pay me (random gold) gold. This page was last modified on 5 April 2019, at 04:26.